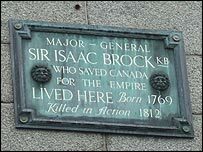 The name of Brock maybe well known locally but there is one illustrious owner of this name, General Sir Isaac Brock, who is credited with saving Canada for the Empire from the attack by the Americans 1812. Knowing how much the Canadians gave in manpower and support in the 2 World Wars to Britain and the Empire, who knows, but if he had failed the history and fate of modern Britain may have been very different indeed. In this article we take a (brief) look at the life and career of one of the most famous sons of Guernsey. Isaac Brock was born in 1769, the same memorable year which gave birth to Napoleon and Wellington. Like these colossal historic figures Brock was destined to make a major impact on the history of Britain and the world. Born on 6 October 1769 Isaac Brock grew up in St Peter Port and was educated in the island until the age of 10 when he was sent to a school in Southampton. Today his families’ house at the bottom of Smith Street, now Boots the Chemist, is marked with a rather iconic plaque commemorating it’s previous heroic inhabitant. In March 1785 he followed his eldest brother John into military service when he got a commission as an ensign in the 8th Regiment of Foot and ‘rose’ through the ranks to command the 49th Regiment of Foot before being transferred to Canada in 1802. It should be noted though that in 19th century British Army “rising through the ranks” meant purchasing commissions and promotion (see sidebar). During his time as a regimental officer he was wounded, but not seriously, while fighting in Holland and was at Copenhagen in 1801 when Vice Admiral Horatio Nelson (later Admiral Lord Nelson) destroyed much of the Danish fleet, so it may seem his career took a turn for the worse when his regiment was sent to British North America (Canada). It was the custom prior to and during the period of the Crimean War, for officers to buy their rank in the British army. The system whereby an officer’s commission in the army was purchased, rather than earned, may have its roots traced to the feudal era. This system was fully abolished by 1870. That said, not all first commissions or promotions were paid for. If an officer was killed in action or was appointed to the Staff, this created a series of “non-purchase vacancies” within his regiment. very occasionally rankers could be promoted as well. A farm labourer in 1800 would have earned around £30 to £40 pa. Thus far Brock’s military career and experience was pretty unexceptional and he had only seen action a few times. This was about to change and he was to make an indelible mark on history. At this time the Napoleonic wars were raging in Europe and Brock made no secret of the fact that he would have preferred to be fighting Napoleon in Europe, particular in the Iberian peninsula with Wellington. 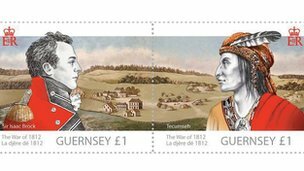 During the ten years between 1802 and 1812, Brock who was an ambitious military man spent a peaceful but frustrating time in North America. Although during this time he did get a lot of hands-on experience as an administrator and several promotions, first to full colonel in 1805, then brigadier general in 1807 and major general in 1811. However when the newly independent American colonies declared war on Britain in 1812 Brock found himself standing in for the administrator of Upper Canada (Ontario), who was on leave in England, he took command of the military defence of the province. When the Americans invaded Upper Canada on July 12, 1812, Brock was ready. He’d already recruited a force of citizens and forged First Nations alliances. Brock went on the offensive capturing Michilimackinac and leading the successful attack at capture of Detroit. Brock was hailed as a hero. After Detroit, the main American threat existed in Niagara, and it was here that Brock would fight his final battle. 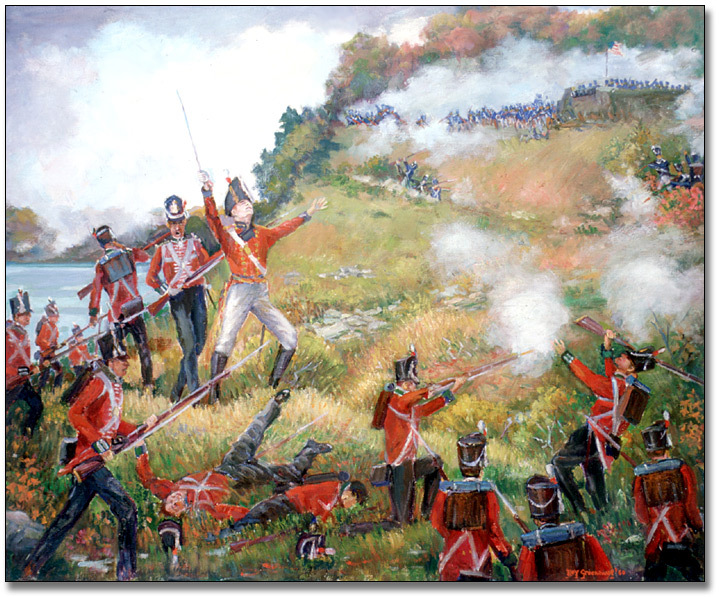 The British were victorious at Queenston Heights, but Brock lost his life while leading his soldiers in a charge. Much of the American force were forced to surrender when cut off from the rest of the army. A limestone monument that contains the remains of Brock is located at Queenston Heights Park in Niagara Falls. Brock never knew he had been given the order of a Knight of the Bath, which he had been awarded for his victory at Detroit, as the news did not reach Canada before his death. His last words are recorded as “Push on brave York Volunteers” referring to one of the Canadian militia units. If Canada had been lost who knows what the consequences would have been if Canada had not remained a loyal and active member of the British Empire during both subsequent World Wars. We can only speculate.